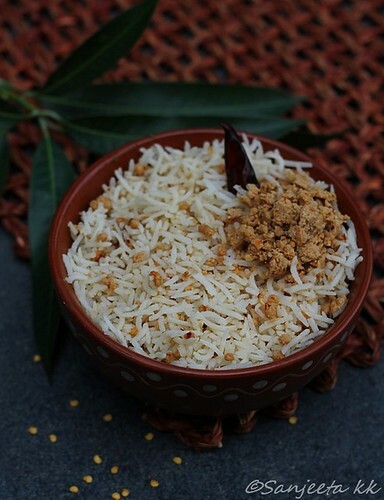 Melon Seed Rice (Dosa Vithulu Annam) Shantaji, a great-grandma from Chennai reminisces about the rice dishes cooked during the month of Marghazhi. Traditionally, women woke up before dawn and prepared a different rice dish every day during this month. This simple preparation uses the seeds of musk melon which are also available in provision stores. Jains can prepare this recipe during Paryushan by using dried melon seeds instead of fresh ones. Roast melon seeds on a low flame until golden brown after sprinkling a teaspoon of water on it. Allow to cool. Grind along with red chillies, salt and asafoetida. Add the ground powder to hot rice with a dollop of ghee. Mix well and serve.